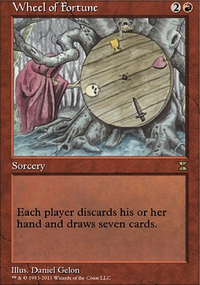 Target player discards all the cards in his or her hand, then draws that many cards. Collective Defiance deals 4 damage to target creature. Collective Defiance deals 3 damage to target opponent. 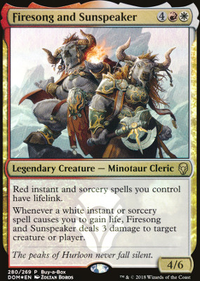 Hey hkhssweiss, if you're still looking for a good janky Monored Commander, I recommend Feldon of the Third Path . Use his ability in order to spam creatures with high power and solid ETB abilities, without worrying about a Counterspell. Typical picks are Molten Primordial , Bogardan Hellkite , Tyrant of Discord , Dragon Tyrant , Rapacious One , Pathrazer of Ulamog , and It That Betrays . Instants and Sorceries like Faithless Looting , Cathartic Reunion , Dangerous Wager , Khorvath's Fury , Collective Defiance , Pirate's Pillage , and Shattered Perception let you put these biggies into your graveyard for early game Feldon recursion. Orbs of Warding can help protect your graveyard from removal. Other notables are Petradon (exile your tapped lands, return them untapped at end step) and Avaricious Dragon (use when you want to dump your hand into the grave, activate Feldon at upkeep to draw an extra card). There are lots of fun tricks you can do with Feldon. Dark Ritual isn't Modern legal. If you're playing casual than don't worry about it. Be sure to add your deck to a Casual Hub for more exposure. If you're ok with playing Blue, look at Jace's Archivist , Windfall , Memory Jar , Magus of the Jar and Forced Fruition , especially for Multiplayer. Good use of Collective Defiance to burn off that excess from Waste Not . Collective Defiance might be worth considering here. Awesome use of Hollow One. As with most budget lists, focussing way in on what you are trying to do and doing just that thing is the best way to make it work. Strip out everything nonessential and see how much space you have for anything else. Giving Wildfire Eternal haste to kick out a big sorcery as your core gameplan sounds good. You can run Living Lore, Spellweaver Helix and draw/discard as well- gameplans that try to use one creature as the lynchpin are easily disrupted, but when you have multiple options, things start looking better. Discard/draw also helps deal with the 'all my cards are stuck in my hand and I can't use them' problem. Next step- ramping and giving them haste. 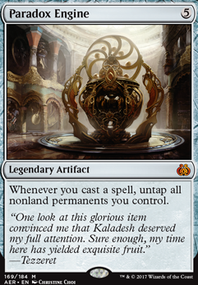 Pentad Prism is a simple, manafixing, ramping artifact that leaves your mana open to cast a counterspell. It'll serve as extra generator servant copies, barring the haste enabler. To give haste is more tricky, as you start needing to look at how much disruption you have compared to enablers compared to payoff. Expedite and Crimson Wisps are powerful options, as they don't cost cards. Hanweir Battlements is another interesting one. Striking a balance between payoff cards (cheating a Cruel Ultimatum or Wildfire usually wins), disruption (Roast, vapor snag, Repeal, Mana Leak etc) and draw/discard (Cathartic Reunion, Faithless Looting, Tormenting Voice, Collective Defiance etc is tricky. Which is why its your job. Look at lists that try to do similar things (cast 2-3 cards for a big payoff), and copy their proportions of cards until you have a mix that feels good. Playtest, playtest playtest. You'll have an FNM crushing list in no time. I wish Brainstorm was modern legal, but the closest you'll find is a 4 drop that lets you do it every turn. Its worth looking at Jace's Erasure and Sphinx's Tutelage and Fraying Sanity. Lots of additional reliablity. Running it alongside spells like Collective Defiance and Incendiary Command or Trade Routes is a solid off-meta strategy. The multi-mode spells are remarkably good in modern- its more the way that they don't fit neatly into established shells than power that stops them being played. Some cards like Goblin Lore are a thing. Draw then discard is powerful alongside 'whenever draw' effects. Just look for what you want to consistantly cast and slam as many copies into your deck as you can. 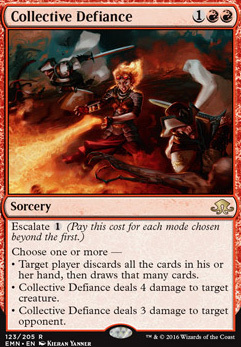 Flame Javelin is great but I think if you are ok running 4x cards with a CMC of 3 then Collective Defiance provides you with a sorcery speed replacement level effect + the option to ditch a hand of lands or put a combo player off their win-con. Seems like a good trade-off 1 or 2. I agree with clockwork swordfish above about Ramunap Ruins as a 1 or 2 of. In games where you flood it's an out. I'd also add some fetch, just for the flexibility of hitting for 3 with Searing Blaze on the opponent's turn. If you agree with me about running a fetch or two, then you should throw in one or two shocklands that allow you to side into Wear // Tear or Destructive Revelry, which is your only option for dealing with things like Worship. Also about your SB: the inclusion of Dragon's Claw tells me you're thinking about long game options. I'd say replace one of those with a Molten Vortex or Seismic Assault. Another good SB option for a sweeper would be 1 or 2 Anger of the Gods over Volcanic Fallout. I have no idea if there's enough go-wide in your meta but just had a thought about running Rampaging Ferocidon.